Mayor of Tirana Edi Rama wins the City Mayors 2004 World Mayor contest on the basis of the number of votes he received (over 5,500) and the comments City Mayors received about him. A selection is published below. The sometimes unpolished nature of the English employed by the writers serves only to accentuate the heartfelt and intense feelings aroused by this vivid figure. City Mayors editorial board have viewed it as their responsibility to show the winner, and why he won. While the overshadowing theme is certainly the gargantuan task of recovering from communist totalitarianism and what Mayor Rama has called the ‘wild individualism’ that came in its wake, the thoughts of his supporters are, like those of most of us about most things, a mixture of both. Awareness of having been helped, however, is primal, and can eclipse calculation, and the citizens of Tirana are in no doubt about who has helped them. Edi Rama has turned this dull, post communist town into something not only highly livable (although one needs to do something about the quality of the air), but also something interesting. A place that people talk about. A town known for its multi-coloured apartment buildings. 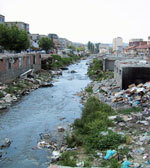 Edi Rama has also inspired mayors of other towns in Albania, turning the whole country bright and clean. He has completely changed the face of Tirana City, and our hopes for a better future persist. Tirana has drastically changed due to his vision for the future, and he has granted again to us pride in being Tirana’s citizens. Due to Edi Rama’s work Tirana is growing like a little baby every day. He has managed to make the municipality a democratic institution, run on the basic principles of democracy. He has managed to identify and use strategies to minimize poverty. He has made feeding the grassroots a priority. He has broken the myth of laziness among citizens and public servants. He has managed to integrate the skills of the artist with those of a very good administrator. I could continue listing his positive attributes indefinitely. I read in couple of magazines about Mr. Rama's work as a mayor in general and what has he done for the architecture of the city in particular. Having in consideration that Albania is not a very stable country after a very long dictatorship, I consider that his work is an incredible example not only for rising countries, but even for powerful ones. Edi Rama should win the title World Mayor 2004, because he has done so much for Tirana, the capital of Albania. It’s easier to be mayor or politician in a big country that has developed its economy and democracy, but not in Albania, a country still in transition. Edi Rama made the city a better place to live, work and enjoy life. There are so many Albanian emigrants around the world, and they are about to come back because they see hope in this guy, in his spirit and his charisma. I am one of them. I wish that he is going to be on top of this list; he well deserves that. I would have liked that there was a better view [on your website] of the changes in the city of Tirana. As a person who has lived out of Albania for a long time, being there last year after a period of two years made me believe that something had changed for the better in that city. From a provincial city without any infrastructure and without any green space, where everybody sat in the bars of Park Rinia, to a city where you see that people are beginning to work, where the face of the city changes from day to day. Where people begin more to think that they should be more aware of the importance of public property. But help exists not only in the civil structure of the city. Look at the support given in the schools, in the health system and to the senior citizens of the city. He really deserves the prize in order to boost the good changes in Tirana. I have many reasons to tell you about Edi Rama. In a capital that was full of grey buildings and depression that could be seen in the faces of thousands of people, the miracle, the color and, most important, the hope is now present everywhere. Edi Rama is the hope of Albanians. Tirana is now a modern and beautiful European city. The metamorphosis of Tirana after only four years is glorious; from that hell we have gone to being in a paradise, the name of which is Tirana. 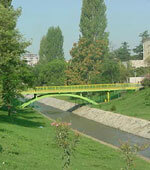 I have seen with my own eyes the changes that Mr. Rama has made in Tirana. He is the most wonderful person in Albania. All Albanians wish to have him as mayor. What he did in his first three years in Tirana no one can believe, and it’s hard for me to describe unless you see. With all the difficulties he faced, he has given to Tirana such a look that, if you did not visit for a year, you wouldn’t believe how it had changed: parks, streets, buildings, schools and everything. Please honor this young mayor, because he deserves it. There could probably be tons of good mayors in the world. I know very few of them. The best I know is Edi Rama. Not too many people know him, but his accomplishments are outstanding in the light of the possibilities and difficulties he has to deal with daily in his city. It is difficult to compare his accomplishments with those of another mayor (let’s say, the Mayor of London, UK) due to the peculiarities of these countries. I am sure that the accomplishments of Mr. Rama (Tirana, Albania) are more valuable than those of any other mayors because of the very limited resources that he had and the greater and more complicated problems he has to solve. He has no political support, but he has the support of his citizens, which he totally deserves. I am sure that his citizens would be glad to see him winning this award. It’s easy to be a successful Mayor of a big city like Berlin or New York. You need to have special qualities to make what Edi Rama has made of the city of Tirana in these past years. You should visit Tirana first, and then you can vote for the World Mayor. He is a complete artist, with a great personality! During the dark period of transition, Albania suffered a lot of bad things, and one of them was wild building and corruption, but since Mr. Edi came everything is going better and better. It’s a pity that he isn’t head of state. He improved the life conditions of Albanians and gave Tirana another, improved image!! He works a lot to raise the awareness of people of the importance of the living environment, as well as of living in a community. He has done a magnificent job in bringing Tirana into the 21st century. The fast growing metropolis has a different face, a new identity and renewed hope for the future. He has left a huge impact not only on the infrastructure but on the mentality of the 800,000 inhabitants. I hope he gets the international recognition he deserves. I belong to the civil society sector in Albania. I am an NGO Executive Director. Because with his work and deeds he has revived the hope of Albanians that Albania is a country where one can live and enjoy life. He has changed the face of Tirana, and he is doing that more every day. He works day and night with unmatched patience and courage to rebuild a city that nobody could have believed they would ever see so transformed. He is able to mobilize and involve the community and businessmen to reach his goals. He is an artist, and he is so creative and has a lot of new ideas. He is anticonformist, and fights for the truth to triumph. He is very smart and intelligent, and his speeches are brilliant. He is a man of speech and action together. There are some other reasons I vote for Edi Rama, but I do not have enough time to list them. Edi Rama is the man who changed a whole city. Now there is a new Tirana, coloured, happy, with a new and improved infrastructure and cultural life. I think Edi Rama is the man that has done the best for his country and for Tirana’s citizens. No matter if he wins or not. Most important is that he is a WINNER for me, and for most of the people of Tirana. Thank you, Edi, from my heart. You are surely the hero of my city. Thought, gut-feeling, self-confidence, open-mindedness are only some of the ingredients of the character of Mr. Rama. A model of a first citizen. I am an Albanian physically living abroad, but my mind and heart live there in Tirana, Albania, my motherland. I want to be short but precise. The commitment of Tirana’s Mayor, Edi Rama, can’t be compared to that of anyone, taking into consideration the challenges he had to face when he was elected. It would take a long time to describe the Tirana of ’98, but I can make a comparison: it has changed as if from night to day; even a blind person can bear witness to the utter change of Tirana during Rama's leadership. It’s amazing hearing people, coming to Tirana after years, say that they don’t know their town, thinking they could be anywhere else, but not in Tirana. Being so young and facing such challenges, I think he deserves to win this year’s top award, and to be the World Mayor. It is hard to go against the crowd. Edi Rama was the only politician who fought against the system to see his ideas realized. He is a good, smart, crazy mayor, who made Tirana beautiful. Edi Rama should be given the World Mayor 2004 title. I apologize, but it is impossible for me to explain all that Mr. Rama has had to endure and the nonexisting infrustructure he had to work with. You almost need to have lived in Albania to understand. Mr. Edi Rama is not only a great mayor, but a hero to all generations of the city of Tirana. He took a bold stand to work with the utmost dedication for a better, cleaner, safer and orderly place to live in. He is showing the Albanian people that working together can achieve great results, that the answer is not leaving the country, but working hard in Albania for a better future. He has done more in the last four years that he has been the mayor of Tirana than all the mayors of the past 15 years put together. The results are not just cosmetic, they are tangible in every direction. I don’t know about other mayors; I am sure they are great, to have been nominated for this award. All I know is that only Edi Rama’s leadership and personal dedication to Tirana’s people’s wellbeing have brought about the great changes. Thanks to him not only the Tiranan people, but the Albanian people as a whole can hope again. Please elect Mr. Edi Rama. I vote for Mr. Rama, and I believe that he should be the winner because of a metamorphosis that Tirana went through after he assumed the position of Mayor. All the other mayors in your list have mostly kept what was already built in their cities, and implemented very few programs, but Edi Rama has radically changed the face of the city of Tirana. The city came from the poor leadership of a former mayor who was deeply corrupt and created only more work for the future leader. The former mayor took Tirana from point eight to point zero by destroying everything beautiful in the city, such as the parks (by building ugly kiosks and throwing trash in the river that crosses through the main streets of Tirana). When Mr. Rama became mayor, he gave birth to the city once more, and made a great foundation to work upon. He re-built the city. Edi Rama is a reckless but plenty-of-ideas administrator. One year ago, the opposition parties were able to prove his corruption and his henchmen’s corruption, demonstrated by his deeds and misdeeds. His case is very interesting; it is the case of an utterly ambitious, authoritarian and intelligent man who is able to serve his community although driven by ambition rather than idealism. If someone wants to scrutinize a perfect case of rational choice theory, welcome to Tirana. Rama merits a vote for being a rare species. It’s a long time since Tirana and Albania have seen such a volume of work done as they have in the past four years. It’s not a question of time, it is just a question of individual strength and vision. These two qualities are the real power of Tirana’s mayor. His contemporary concept of work has made Tirana look different. It also seems that a call of conscience that every young Albanian has is perfectly embodied in Tirana's mayor. Mr. Edi Rama is the most successful mayor of Tirana so far. He is the only one who will be recalled by generations for his great efforts to change Tirana’s appearance and to improve the life of its inhabitants. I read the comments from Blerta, published on this website, and I do fully agree with every bit of her comment regarding the wonderful work of Mr. Rama for Tirana. I wish that he would be re-elected mayor of Tirana for some other terms as well. I admire his excellent capacity as a contemporary manager, and his courageous character to do things right in a country like Albania. Edi Rama is something else altogether from your average politician, in fact the reason he is so successful is that he is NOT one. He represents a new generation of Albanians, one that has no more time to waste, and no doctrines to experiment with, no ‘great fathers’ to listen to and follow. I find him arrogant, at times unpleasant, I have never felt he can give an interview, but above all I can see the city I love, and was born in, and I know how much he had to do with the way it looks and feels these days. Edi Rama, thank you!